Karystos is the name of the Archaic and Classical polis and of the modern town on the southern tip of the island of Euboia. 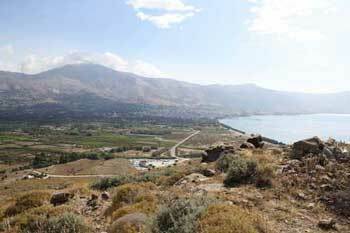 The town and its territory – Karystia – played an important role in the history of Greece and the Aegean. The name surfaces in Linear B documents from Mycenaean Thebes (ka-ru-to; Palaima 2010) and is mentioned in Homer’s Iliad (2. 539). The archaeological site of Plakari is located on the north-western edge of Karystos bay about 2.5 km west of the modern town. 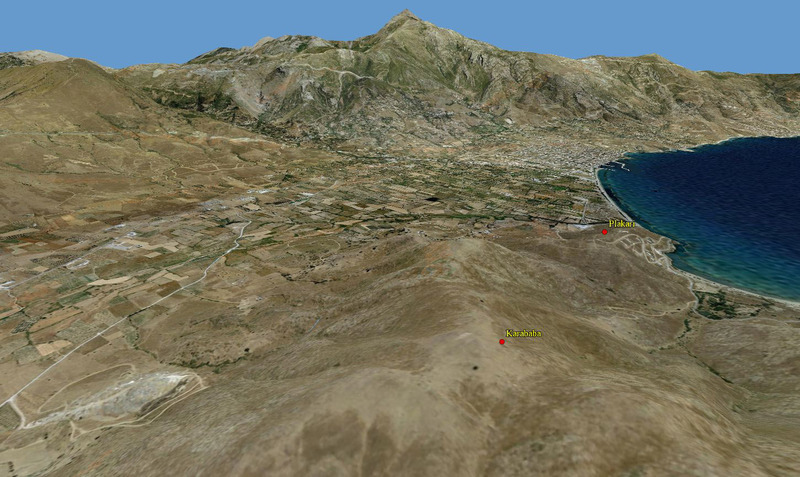 It is a low schist ridge with a maximum elevation of 85 m above sea level. In antiquity it probably dominated the landscape as a headland jutting into the sea. Plakari offers excellent views of the Karystos plain to the north, Karystos bay to the south and some of the Cycladic islands in the distance. Because southern Euboia is separated from the rest of the island by the mountainous area around Styra to the north, Karystia has a distinctive character. Its barren, rugged mountains, schist bedrock and steppe vegetation are more Cycladic than Euboian. Southern Euboia is strategically located at the crossroads of several maritime routes that connect the Cycladic archipelago, the coast of Attica and regions bordering the Euboian Gulf. Recent research has shown that settlements in these coastal areas were interconnected by seaborne networks from an early age onwards (Crielaard 2006). Surveys indicate that the Karystos region was first occupied in the Late Neolithic. The 50-plus documented prehistoric sites and find spots show that human occupation is characterized by a dispersed settlement pattern during the Late and Final Neolithic periods and the Early Bronze Age (Talalay et al. 2005; Cullen, Talalay & Tankosić 2011). Plakari is one of these settlements, though not the earliest (Keller 1985, 165–79; Cullen, Talalay, Keller, Karimal & Farrand 2013).The same FN and EBA periods are represented in the ritual and funerary activities inside the Ayia Triada cave in the foothills of Mt. Ochi (Mavridis & Tankosić 2009). 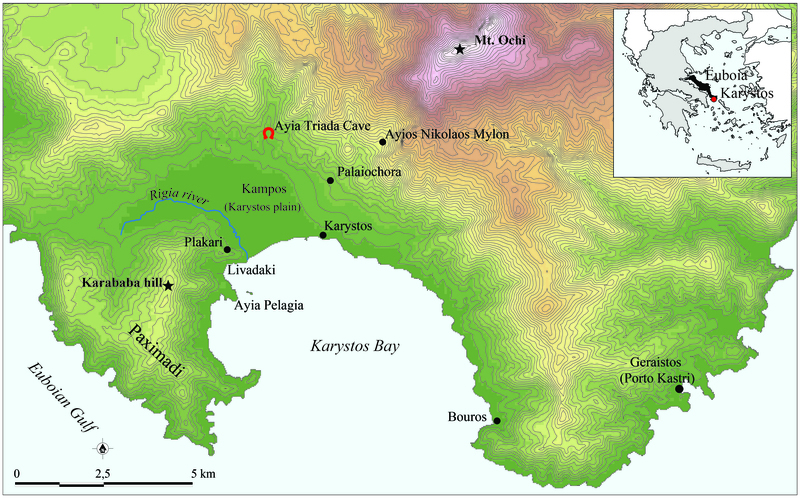 In the Middle Bronze Age, habitation in the Karystia was confined to the hilltop site of Ayios Nikolaos Mylon, northeast of modern Karystos; this site has also produced a few possible Mycenaean fragments (Tankosić & Mathioudaki 2009; 2011). Although scattered settlement nuclei existed in the Early Iron Age and Archaic period, the only settlement of some size and importance was at Plakari which seems to have housed the polis’s main urban centre. From the Classical period onwards there is additional evidence of extensive habitation in the form of small farmsteads, hamlets and sanctuaries in the rural hinterland (Keller 2006; Keller & Schneider 2011). In this period, Palaiochora –the site of the Hellenistic and Roman city– became the civic centre. Clusters of burials south of Palaiochora, some stretching as far as the northern and western outskirts of the modern town, indicate that the area towards the coast was used as a necropolis for this new centre from the late 6th century BC onwards (Chidiroglou & Chatzidimitriou 2006; Chidiroglou 2011; 2012).